Our blue Planet Earth is a world with surfaces primarily consisting of vast bodies of water. Believe it or not, the landmass only makes up of 29% of our planet! One third of Earth’s total landmass constitutes of deserts of all varieties. The term desert is defined as any land area that has an annual deficit of water, which could range from arid canyons to frigid polar planes. Integrating modern homes into extreme climates has become more than a necessity to natives of such zones; it is an architectural and artistic niche fueling the passion for millions. Desert design is innovative endeavor of insulating each space to create a temperature neutral interior climate, melding materials with the geographic landscape, and maximizing use of solar energy by taking advantage of natural resources, and fuzing elements of modern technology. Each of these unique designs presents contemporary designs with state of the art technology, creating a new world of modern living in extreme climates. 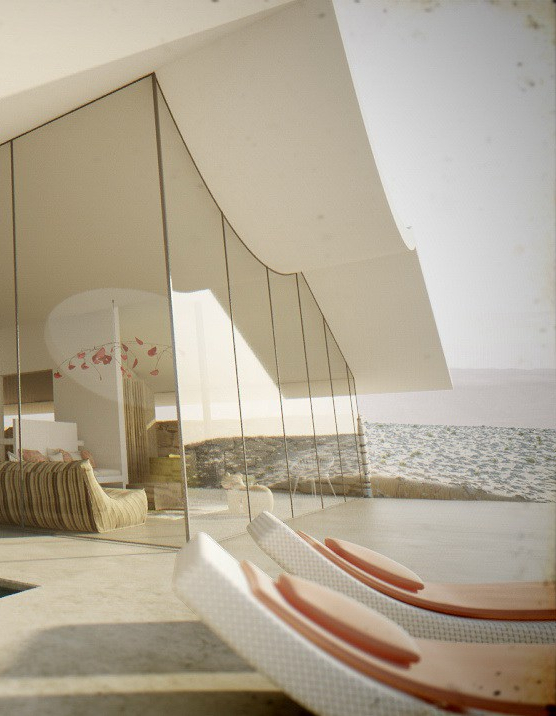 This design has mastered merging the magical scenery of the desert with modern design and architecture. Don’t be fooled, this marvelous beauty doesn’t quite exist yet, this is just an artistic rendering! Alavi House is situated at the foothills of the Zagros Mountain range at the edge of a desert. The 194-square-meter solar roof features 104 solar modules capable of meeting a minimum of 29,000 kWh a year, far exceeding the average electricity consumption of an Iranian household. Tesla is revolutionizing the way we power and build our homes – and architects are taking note. Due to the arid climate, the architects used the prevailing winds from the south and southwest to inform the roof’s sloped shape and direction. The home is finished in concrete save for the double skin on the sloped roof that would be clad in the nearly imperceptible Tesla solar cells installed 30 centimeters above the roof. The operable double skin roof can rotate open to allow the sun to heat the concrete roof and warm the interior. Alternatively on colder days, the roof rotates close to provide shade from the sun, while simultaneously optimizing conditions for generating solar energy. Using raw Concrete and Corten Steel to create a great prefabricated home and art gallery. Planar House, named for its geometric planes features strategic skylights and windows add to the dramatic angles. The rooftop boasts a spectacular view of the desert and Camelback mountain – and has its own sculpture garden. This unusual home is designed by Oller & Pejic Architecture of Los Angeles, partnered with Marc Atlan of Yucca Valley, California. Its dark mystique features geometric intricacies which give it an intriguing allure. Tasked by the Biomimicry Institute’s Student Design Challenge with finding solutions to every day challenges by looking to nature, a team of students, Elnaz Amiri, Hesam Andalib, Roza Atarod, and M-amin Mohamad from the Art University of Isfahan in Iran decided to design a house that is self-cooling – just like a snail. Hesam Andalib told Fastco. Design that the snail has remarkable qualities that has allowed it to stay both cool and moist in even the harshest temperatures. He and the rest of the design team found its form, the material of its shell, and its coping strategies to be qualities worth emulating in architecture. Remarkably, they found that this unique design works like a charm, and the home is delightfully comfortable without air conditioning in even the most formidable heat. This ingeniously resourceful desert technology features a concave roof system to collect rainwater, help cool the buildings, create filtered drinking water, and integrate water into interior graywater systems. The bowl-shaped roof design addresses rapid evaporation, used to channel even the smallest amounts of accumulated rain, coalescing them into drops big enough to harvest before they evaporate. The concave roof systems also provide optimal shade for the structures below, creating an additional cooling system. Situated in the dramatic landscapes of the Palm Desert, this stunning modern home captures the warm gradients of the terrain, while integrating cooling oasis-like plant life and pools to surround the property. Islamic culture is embodied and has been reinterpreted through modern technology and design in this 35,000-square-foot residence in the United Arab Emirates. Searing temperatures and ample desalinated water allowed the desert site to be transformed into an oasis with pools and landscaping. The canopy forms a crescent moon – symbolic of new life – reminiscent of a Bedouin tent, sheathed in shimmering aluminum, adorned in moucharabieh traditional lattice, and lined in fountains, pools, and date palm grove aisles. Check out some more desert masterpieces with a Mid-Century Modern Palm Springs vibe! Where are your favorite desert designs for modern homes around the world? Link us to some architectural dreams!